I want to welcome my newest followers, sometimes I cannot because they are just stopping by and do not leave a blog/web site they came from. 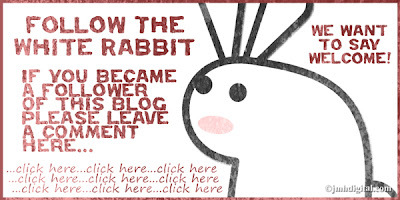 Now you can leave the "follow the white rabbit" banner in the top, right or left of you blog/web site. Make a link to a post or a page greeting new followers, have them leave a comment there and you can keep a good wholesome connection. 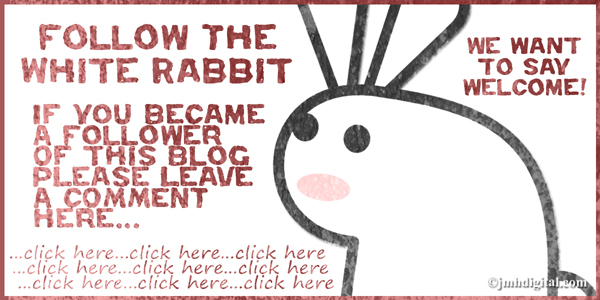 I made these couple of banners for you to use or you can make your own, and why always rabbits you may be asking yourself... I loves rabbits. So get those followers to keep following! What a great idea! I have new followers and I can't follow them back because a. no comment or b. no info. Thanks!!!! LOL. I love those banners! Thank you!